Who really needs piano stickers right? Believe it or not, these stickers are more than just fancy items instead for any newbie they can be a helping hand. But with thousands of stickers in the market picking the best ones is tiresome and confusing but it doesn’t have to be. 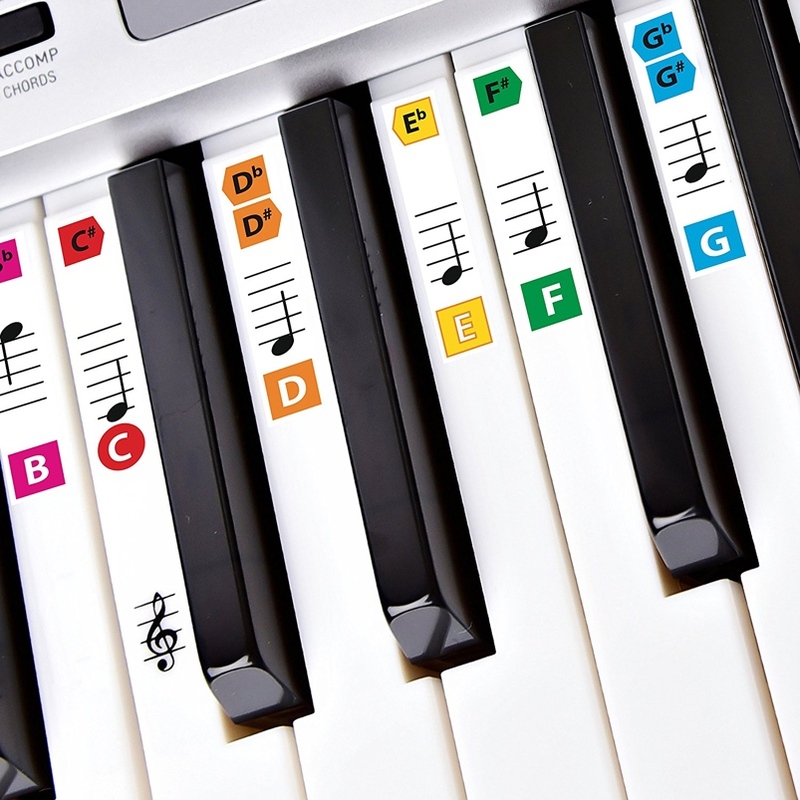 We did the field work for you and picked out the best piano stickers for beginners in 2018. 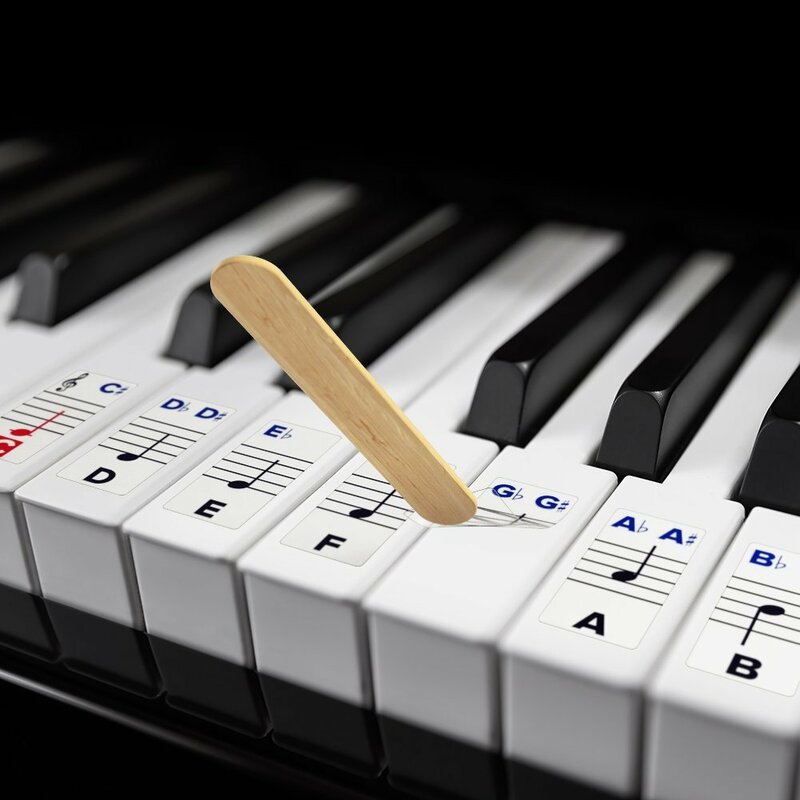 You hardly ever come across a product on Amazon that’s close to perfect but with a 4.8 rating the QMG Piano and Keyboard Music Note Sticker do just that and here’s why the buyers love it so much. With cheap stickers comes the problem of longevity and when they do come off they also end up damaging the keys but with the durable and crystal clear adhesive of the QMG stickers, the keys are safer than ever. The minds behind the stickers are experts in the field of music and thus these stickers have been designed to improve focus and memory quickening the learning process (yup, you don’t need an instructor at all times). The pack comes with 88 stickers and thus can cover a keyboard or piano of any size. With the detailed instruction manual and application stick setting up the stickers shouldn’t take more than 2-3 minutes. Who doesn’t love a bonus right? With the QMG Stickers, you also get an eBook (emailed after order) loaded with the best children songs to help you tune up your skills. Compared to other stickers, the QMG stickers cost a little higher but none match its quality or convenience making it worth the extra bucks. Keysies is another top brand for piano stickers and has been producing quality stickers at extremely affordable prices for years and these stickers are just another example of it. The double coated polyester used solves the issue of the sticker wearing off with regular use as the printed notes are enclosed within the two layers. Also, since a better adhesive has been incorporated the sticker remains glued longer while the rounded of edges prevent it from getting peeled off. Also, since there’s no residue left over the stickers can be easily switched. Putting up the stickers is no Einstein’s job and can be done within minutes using the small wood stick and the placement guide. The pack comes with 52 stickers with dimensions of 16mm by 35mm, perfect for a keyboard with 88 keys or less and it doesn’t overlap the edges either. While the adhesive of the Keysies doesn’t work as well as our first pick for a sticker costing you around $7 it’s an absolute peach. With a rating of 4.7 and over 600 customer reviews the CRBN is sure a crowd favorite and here’s why. Sure it’s low price is appealing but that alone isn’t a good selling point. On the other hand, the double layer manufacture with the print in between for long-lasting visibility is sure to please customers. Apart from that, the pack comes with 15 mm x 35 mm stickers that can cover any keyboard, even your 88 keys keyboard. Also, replacing the old stickers or switching existing CRBN stickers isn’t a headache as it can be done without a trace due to the non-residual nature of the sticker. On the downside, the sticker may need some trimming from the sides and adhesive may fail with regular use. But it will cost you less than $10 and consider the benefits it offers its sure value for money (no wonder it’s a best seller on Amazon). Rounding off our list of the best piano stickers is the Recital Ready Color Keyboard Sticker after all who doesn’t deserve a little of colors in their lives right? With the eBook and an instruction manual applying the stickers on the piano keys is hassle-free and unlike our previous picks, this one comes with a money back guarantee (now that’s a sign of sheer confidence). The colorful yet clearly visible keys and notes on the stickers make learning fun and interesting especially for the younger ones while helping them practice even without an instructor. The sticker pack is perfect for piano of all sizes. While the colors may seem attractive to the younger generation, not often the choice the teens or older generation makes. Also, the adhesive isn’t strong enough and thus the sticker tends to peel off in the long run. In the end, it comes down to personal choice. If you love colors, this one’s made for you and will cost a mere $9-$10.